Bioactive glasses are able to bond to bone and stimulate the growth of new tissue while dissolving over time, which makes them ideal materials for regenerative medicine. The advent of mesoporous glasses, which are typically synthesized via sol-gel routes, allowed researchers to develop a broad and versatile class of novel biomaterials that combine superior bone regenerative potential (compared to traditional melt-derived glasses) with the ability of incorporating drugs and various biomolecules for targeted therapy in situ. Mesoporous glass particles can be directly embedded as a bioactive phase within a non-porous (e.g., microspheres), porous (3D scaffolds) or injectable matrix, or be processed to manufacture a surface coating on inorganic or organic (macro)porous substrates, thereby obtaining hierarchical structures with multiscale porosity. 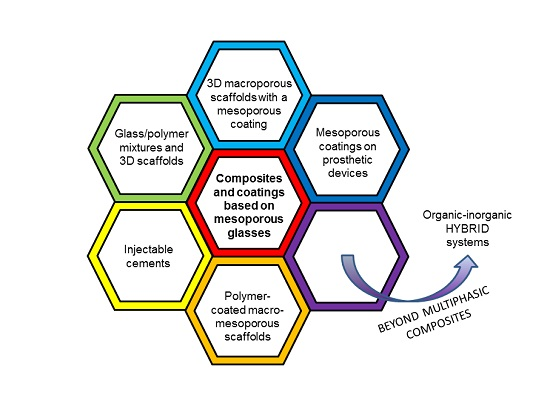 This review provides a picture of composite systems and coatings based on mesoporous glasses and highlights the challenges for the future, including the great potential of inorganic–organic hybrid sol-gel biomaterials.